Above: Small rugose corals from Ordovician limestone near Cincinnati, Ohio. Rugose corals are an extinct group of anthozoans that originated in the Ordovician and went extinct at the end of the Permian. Members of the Rugosa are sometimes called horn corals because solitary forms frequently have the shape of a bull's horn (colonial forms do not have this shape, however). Two solitary rugose corals in a slab of Ordovician limestone from near Cincinnati, Ohio. Note the similarly of the left specimen's shape to that of a bull's horn. 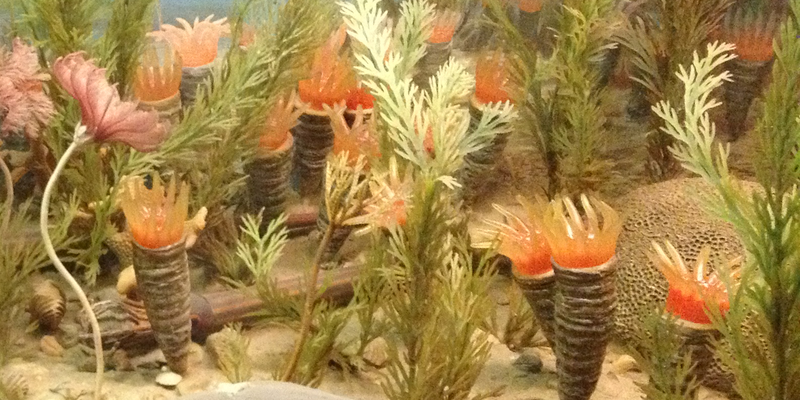 A reconstruction of Ordovician-aged solitary rugose corals on display in a diorama at the American Museum of Natural History in New York City. The Paleobiology Database recognizes a total of 29 families of rugose corals, 488 genera, and 1337 species. 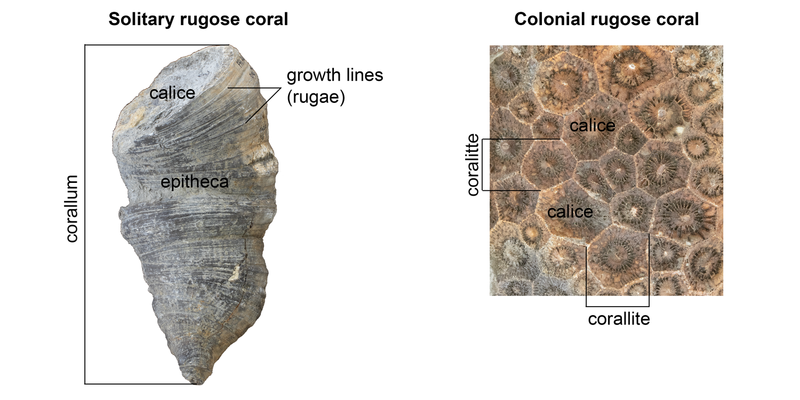 Rugose corals reached their peak diversity during the Devonian period, when colonial forms were important reef builders. As far as we know, rugose corals did not survive the end-Permian mass extinction event. 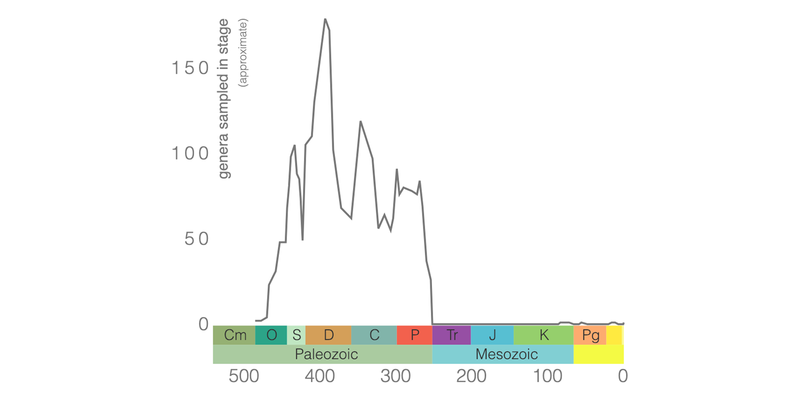 Diversity of Rugosa genera based on data from the Paleobiology Database. 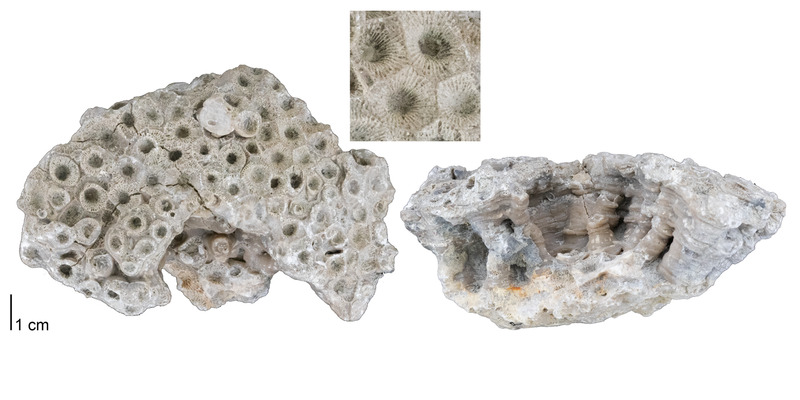 Perhaps the most well-known rugose coral to rock hounds is the "Petoskey Stone," which is the state stone of Michigan. 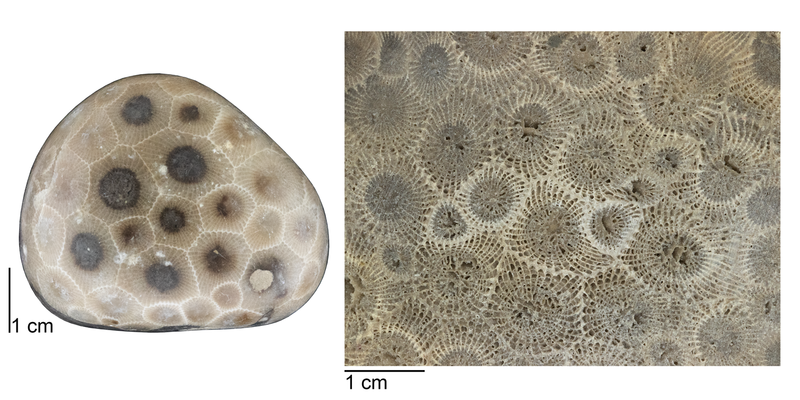 Petoskey Stones are glacially rounded chunks of the colonial genus Hexagonaria (see examples below). These stones are locally common at some places in Michigan and are especially attractive when polished and cut. "All About Petoskey Stones" by MVPMeredithVideo. Source: https://www.youtube.com/watch?v=0UNpxkWBPWY. Rugose corals may be either solitary or colonial. A solitary coral individual is called a corallum (plural = coralla), while an individual within a colony is called a corallite. Rugose corals made their skeletons from calcite; this is a significant difference relative to hexacorals, which make their skeletons out of aragonite. The outer part of the corallum (or corallite)--that is, the skeletal wall--is called the theca. The theca may in turn be covered by an outermost skeletal sheath called the epitheca. Growth lines are often apparent on the epitheca; these are also called rugae ("ruga" is Latin for wrinkled), which gives this group of corals their scientific name (thus, rugose corals are the "wrinkled corals"). The top of the corallum (or corallite) is called the calice and it is the portion of the coral occupied by the living polyp (see diorama reconstruction above). Major features of solitary and colonial rugose corals; labeled features include a corallum, coralittes, epitheca, calices, and growth lines. Left: Heliophyllum halli from the Middle Devonian Moscow Fm. of Erie County, New York (PRI 70755). 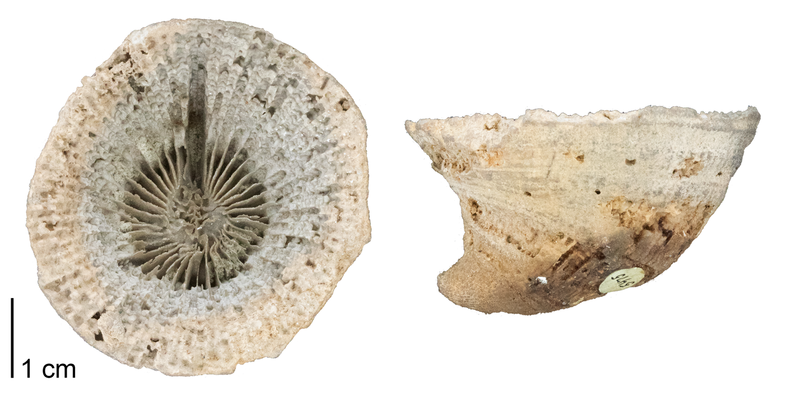 Right: Acrocyathus floriformis from the Mississippian St. Louis Limestone of Monroe County, Illinois (PRI 70756). Both specimens are from the collections of the Paleontological Research Institution, Ithaca, New York. The surface of the calice is covered with radiating, vertical structures called septa (singular = septum) that resemble the spokes of a bicycle wheel. Septa sometimes extend through the theca, forming vertical lines called costae (singular = costa). The septa radiate outwards from a central pillar-like structure called the columella. In rugose corals, the septa are added during growth in a manner that ultimately divides them into four quadrants. Spaces (or, gaps) between the four quadrants are called fossula. It is important to note, however, that the fossula are not readily visible in many specimens, especially when preservation is poor. 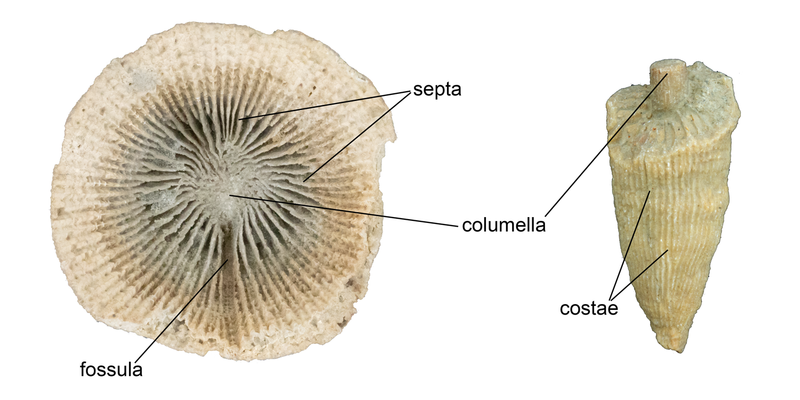 Important features of rugose corals, including a fossula, septa, the columella, and costae. 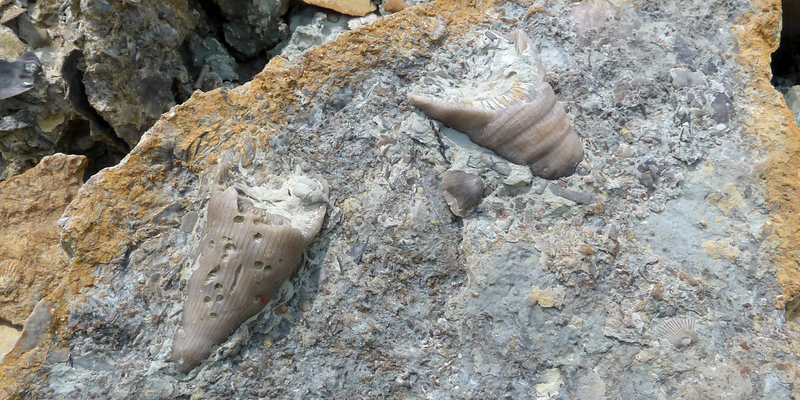 Left: solitary rugose coral Heliophyllum canadense from the Devonian Onondaga Limestone of Mendon, Ontario (PRI 76809). 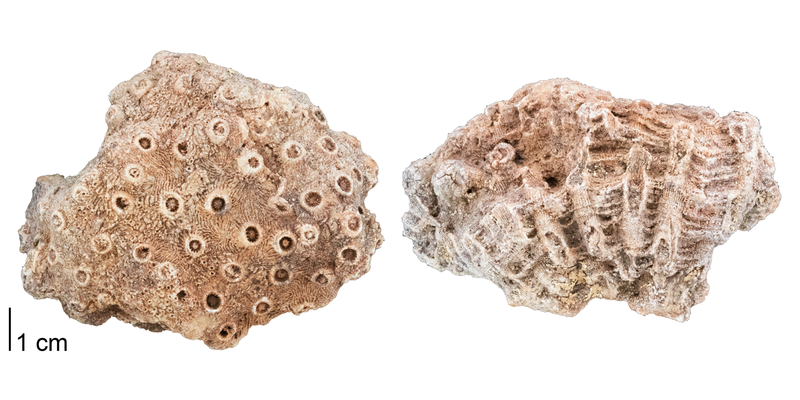 Right: solitary rugose coral Lophophyllidium proliferum from the Pennsylvanian Graham Formation of Coleman County, Texas (PRI 76802). Both specimens are from the collections of the Paleontological Research Institution, Ithaca, New York. As a coral polyp grows upwards, it lays down behind itself flat plates called tabulae or smaller dome-shaped plates called dissepiments; both features are best viewed in thin section. Tabulae observed in hand sample in two solitary rugose corals. 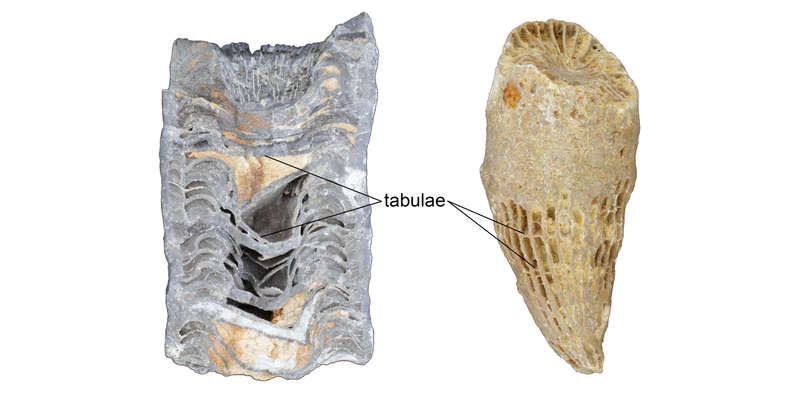 Left: Siphonophrentis halli from the Devonian Ludlowville Fm. of Skaneateles Lake, New York (PRI 76806). 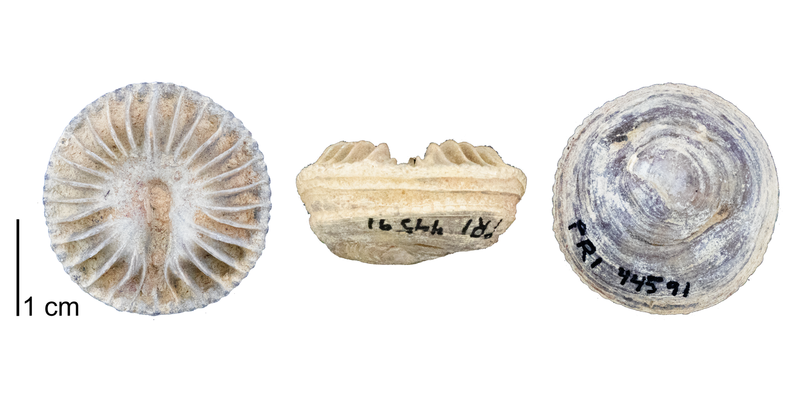 Right: Amplexizaphrentis pellansis from the Mississippian Pella Beds of Pella, Iowa (most of the epitheca is eroded away) (PRI 76803). Interactive 3D model of a solitary rugose coral (Heliophyllum sp.) with key features annotated. This fossil is from the Middle Devonian Ludlowville Formation of Genesee County, New York (PRI 5541). Specimen is from the collections of the Paleontological Research Institution, Ithaca, New York. It is approximately 9.5 cm in length. Model by Emily Hauf. The arrangements of septa, tabulae, and dissepiments are all very important for the recognition of different species and higher taxa of rugose corals. Often these structures are best observed under a microscope using a combination of thin sections cut at longitudinal (showing septa) and transverse (showing tabulae and dissepiments) angles relative to the direction of growth. We all know that there are approximately 365 days in a year (the time it takes for Earth to revolve once around the sun) and 24 hours in a day (the time it takes for the Earth to rotate once around its axis). Has the length of a day on Earth always been 24 hours? Physicists have known for some time that Earth's rate of rotation has very gradually slowed over time due to the moon's exertion of a gravitational pull on Earth's ocean water (which results in tides). In other words, Earth must have spun faster upon its axis many millions of years ago, thus causing days long ago to be shorter. Therefore, we would predict that during the Paleozoic, there would have been more days per year than there are today (we do not have any evidence that the span of a year has changed appreciably over geological time). How could this hypothesis be tested? During the early 1960's, a very clever Cornell University paleontologist named John Wells used rugose corals to address the question of many days per year there were in the geological past. From his research, Wells knew that modern corals grow just a little bit every day, leaving behind a fine visible growth line on the epitheca. He also knew that modern corals often produced thickened growth bands (or, annulations) once per year, possibly due to changes in seasonal water temperatures. When he counted the number of daily growth lines between the annulations on the modern corals, he predictably counted almost 365 (i.e., nearly one per day). What about the number of daily growth lines in Paleozoic rugose corals, which show the same sorts of thickened bands (which Wells assumed also reflected annual patterns in skeletal growth)? Heliophyllum halli from the Middle Devonian Moscow Fm. of Erie County, New York (PRI 70755). This is one of the genera of rugose corals studied by Wells, though is not one of his specimens (the location(s) of Wells' specimens are currently unknown). Insets show details of fine growth lines (likely not daily growth lines, however) and possible annual banding. Specimen is from the collections of the Paleontological Research Institution, Ithaca, New York. 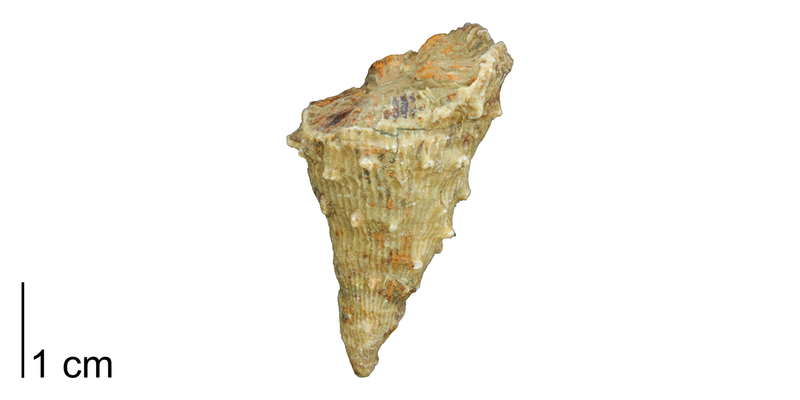 An interactive 3D model of this same specimen is below. Heliophyllum halli from the Middle Devonian Moscow Formation of Erie County, New York (PRI 70755). Specimen is from the collections of the Paleontological Research Institution, Ithaca, New York. Specimen is approximately 11 cm in length. Model by Emily Hauf. Compare with images above. When Wells counted the daily growth lines per annual cycle on Middle Devonian rugose corals, he counted 385 to 410 growth lines (400 was typical). Pennsylvanian corals showed 385 to 390 lines. Thus, Wells corroborated--using simple observations of specimens of fossil corals--the finding of physicists that Earth's rate of rotation has slowed over time. His results suggest that there were ~400 days/year during the Middle Devonian and ~390 days/year during the Pennsylvanian. Over time, the Earth's rate of rotation has continued to decrease--albeit at a very, very slow pace--and this trend will continue for millions of years to come. Cumminsia aplata from the Pennsylvanian of San Saba County, Texas. Specimen is from the collections of the Paleontological Research Institution, Ithaca, New York (PRI 44591). 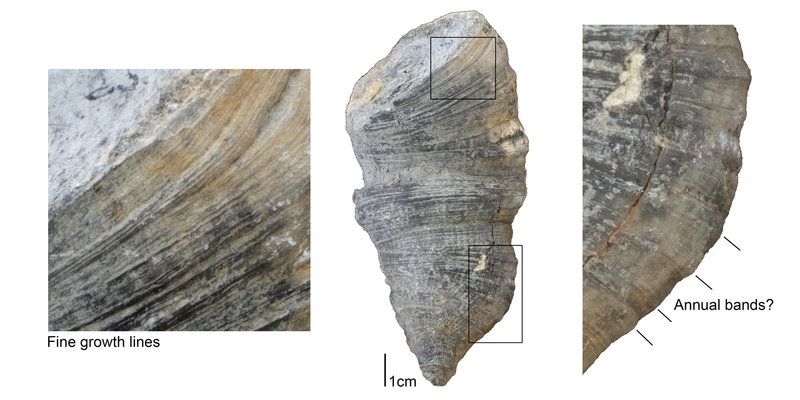 Heliophyllum canadense from the Devonian Onondaga Limestone of Mendon, Ontario (PRI 76809). Specimen is from the collections of the Paleontological Research Institution, Ithaca, New York. 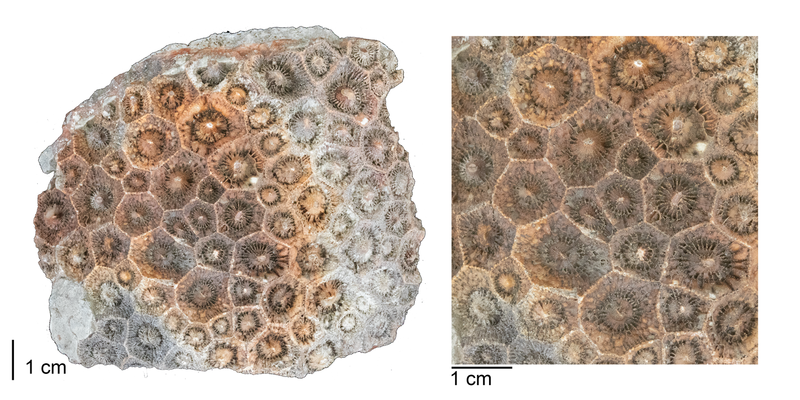 The large rugose coral Siphonophrentis gigantea from the Devonian Onondaga Limestone of Erie County, New York (PRI 44598). Specimen is from the collections of the Paleontological Research Institution, Ithaca, New York. 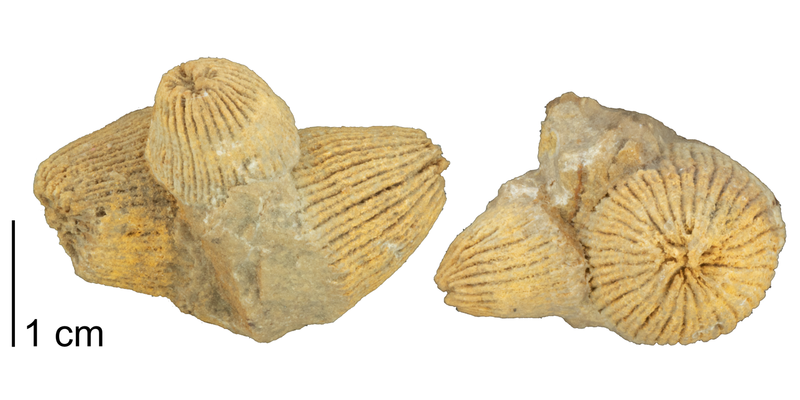 Zaphrentites spinulosum from the Mississippian of Tennessee (PRI 70757). Specimen is from the collections of the Paleontological Research Institution, Ithaca, New York. Specimen is approximately 3.5 cm in length. Model by Emily Hauf. 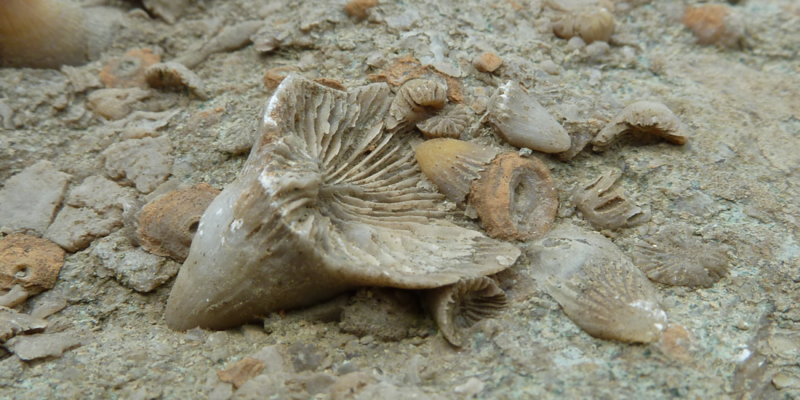 Lophophyllidium radicosum from the Pennsylvanian Wayland Shale of Coleman County, Texas (PRI 76801). Specimen is from the collections of the Paleontological Research Institution, Ithaca, New York. 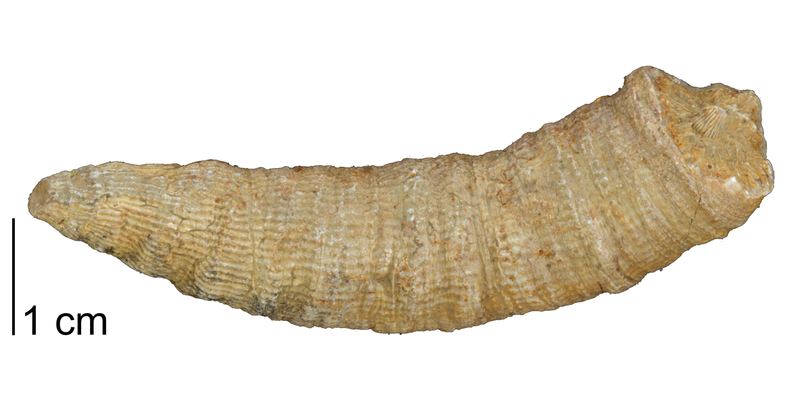 Lophophyllidium proliferum from the Pennsylvanian Graham Formation of Coleman County, Texas (PRI 76802). Specimen is from the collections of the Paleontological Research Institution, Ithaca, New York. Internal molds of solitary rugose corals from the Ordovician of Mineral Point, Wisconsin (PRI 76805). The long grooves represent the former positions of septa, which have dissolved away. Specimen is from the collections of the Paleontological Research Institution, Ithaca, New York. Acinophyllum stramineum, from the Devonian Onondaga Limestone of Erie County, New York. Specimen is from the collections of the Paleontological Research Institution, Ithaca, New York (PRI 76812). Acrocyathus floriformis from the Mississippian St. Louis Limestone of Monroe County, Illinois (PRI 70756). Specimen is from the collections of the Paleontological Research Institution, Ithaca, New York. 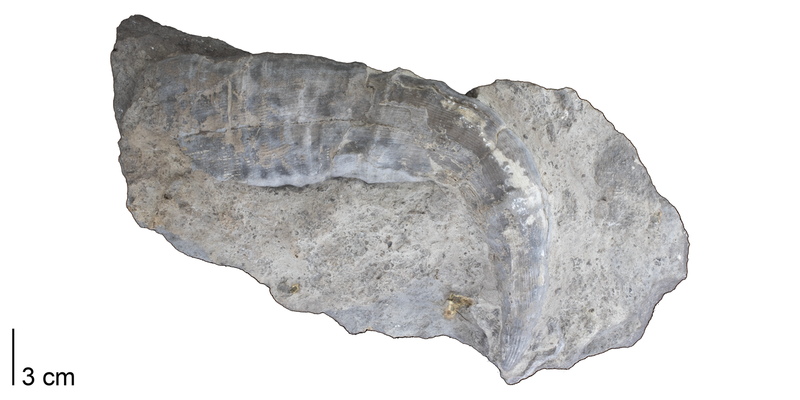 An interactive 3D model of this specimen is immediately below. Interactive 3D model of Acrocyathus floriformis from the Mississippian St. Louis Limestone of Monroe County, Illinois. Specimen is from the collections of the Paleontological Research Institution, Ithaca, New York (PRI 70756). Also see photographs of this specimen above. 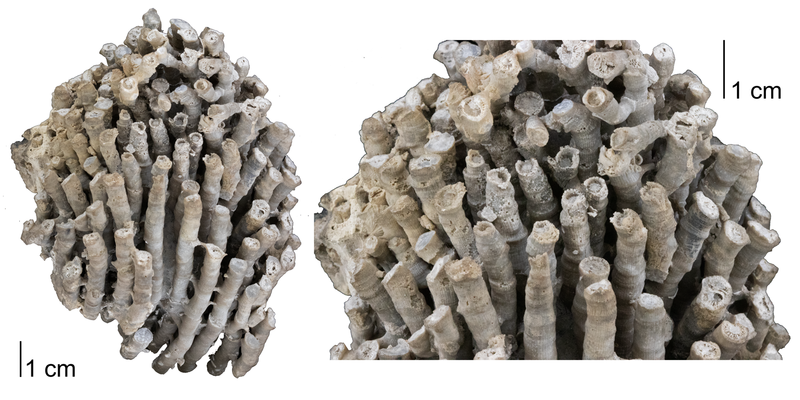 Interactive 3D model of the colonial rugose coral Acrocyathus floriformis from the Mississipian St. Louis Limestone of Monroe County, Illinois (PRI 70756). Specimen is from the collections of the Paleontological Research Institution, Ithaca, New York. Specimen is approximately 9 cm in length. Model by Emily Hauf. Hexagonaria percarinata from the Middle Devonian of Presque Isle County, Michigan (PRI 76813). Specimen is from the collections of the Paleontological Research Institution, Ithaca, New York. This is a natural specimen of Petoskey stone (see below). Left: A polished Petoskey stone. Right: An unpolished section of Petoskey stone. Petoskey stone is derived from the colonial rugose coral Hexagonaria percarinata and is the state stone of Michigan. Both specimens are from the Devonian Traverse Group of Alpena County, Michigan (PRI 76814). Specimens are from the collections of the Paleontological Research Institution, Ithaca, New York. See also natural specimen above. Pachyphyllum nevadense from the Devonian Martin Fm. of Arizona (PRI 41824). Specimen is from the collections of the Paleontological Research Institution, Ithaca, New York. Benton, M. J., and D. A. T. Harper. 2009. Introduction to Paleobiology and the Fossil Record. Wiley-Blackwell, 592 pp. Oliver, W. A., Jr., and A. G. Coates. 1987. Phylum Cnidaria. Pp. 140-193, in: Boardman, R. S., A. H. Cheetham, and A. J. Rowell (eds. ), Fossil Invertebrates, Blackwell Scientific Publications, Palo Alto. Wells, J. W. 1963. Coral growth and geochronometry. Nature 197(4871): 948-950. Wells, J. W. 1966. Paleontological evidence of the rate of the Earth's rotation. Pp. 70-81, in: B. G. Marsden and A. G. W. Cameron (eds. ), The Earth-Moon System, Springer.